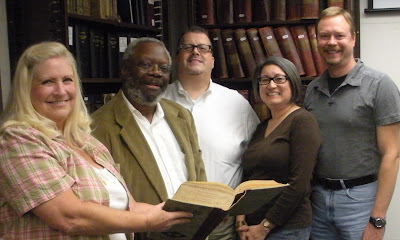 The reviews are in and Saturday's Genealogy Blog Workshop was a smashing success. 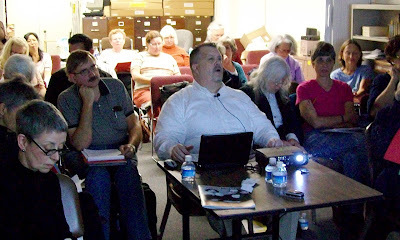 Twenty-five participants gathered at the California Genealogical Society Library for three presentations by two well-known gen-bloggers and CGS members, Thomas MacEntee and Craig Manson. Thomas got things started with "Become A Genealogy Blog User" – an overview of blog basics – with instructions on how to use blog readers, how to leave comments and how blogs can help with genealogy research. Attendees received a comprehensive hand-out which included a list of dozens of helpful genealogy blogs. 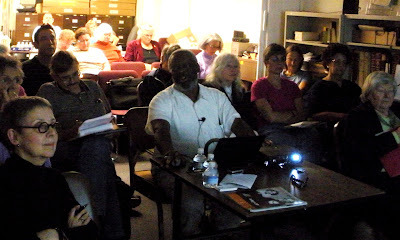 His second session was the "nuts and bolts" part of the day as MacEntee presented "How To Build a Genealogy Blog." CGS member volunteer Craig Siulinski provided the specifics in advance so Thomas was able to create a blog to Craig's specifications and the audience was able to see just how easy the process is using Google's Blogger. Craig Manson ended the day with "Blogging and the Law" – a review of the copyright acts, their duration and limitations, fair use, public domain works, using photographs, defamation and privacy. Two audience members deserve special recognition – bloggers Cheryl Palmer and Steve Danko came to lend support. Of course we took the opportunity to pose for a group geneablogger photo! Cheryl Palmer, Craig Manson, Thomas MacEntee, Kathryn Doyle and Steve Danko. 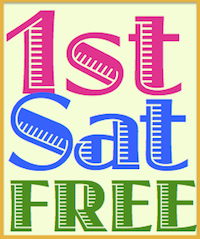 CGS member Cynthia Gorman summed up the day like this: "Great program, speakers and afternoon! Photographs courtesy of Tim Cox, October 10, 2009, Oakland, California. Hi,Kathryn. Wish I could have been there to see everyone. Sounds like it was great! It is so super to have two of us geneabloggers as your guest speakers and to read about them and to see your live tweets! Schelly, I wish you could have been here too! Perhaps next year we can get you to Oakland after Jamboree. Midge, the next time we get Thomas out here I hope you'll join him. You two cousins need to meet!